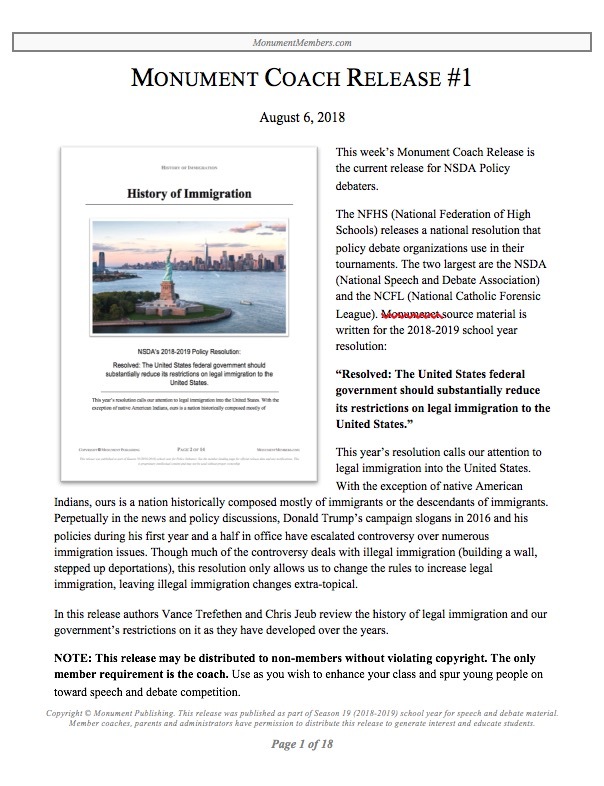 About "Coach Synopsis for August 6, 2018"
This week’s Monument Coach Release is the current release for NSDA Policy debaters. This year’s resolution calls our attention to legal immigration into the United States. With the exception of native American Indians, ours is a nation historically composed mostly of immigrants or the descendants of immigrants. Perpetually in the news and policy discussions, Donald Trump’s campaign slogans in 2016 and his policies during his first year and a half in office have escalated controversy over numerous immigration issues. Though much of the controversy deals with illegal immigration (building a wall, stepped up deportations), this resolution only allows us to change the rules to increase legal immigration, leaving illegal immigration changes extra-topical. In this release authors Vance Trefethen and Chris Jeub review the history of legal immigration and our government’s restrictions on it as they have developed over the years.